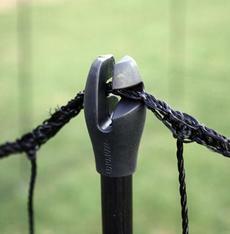 This handy netting comes in a 12, 21, 32 or 42 metre roll and is very easy to put up and move about. 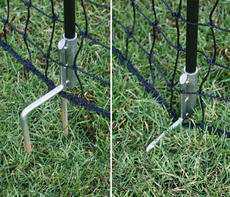 You simply push the poles into the ground to secure it in position. It can be used to to keep your chickens within an area, giving them more space, or out of an area, like your prized vegetable patch. 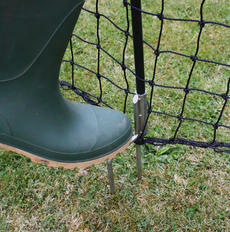 All poles have two spikes making it easy to 'tread' them into the ground and all Omlet Netting comes with a gate making it easy to get in and out to feed your chickens. 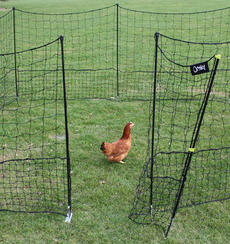 Omlet Netting is also suitable for use with smaller birds like bantams. The bottom section of the netting has holes that are only 50mm wide to stop them wriggling their way through. The holes higher up are 100mm wide. Overall height 1250mm, which is taller than most nettings! Includes Spiked Poles and 1 Door Pole. Please note: This netting cannot be electrified. It is not fox proof and it is to keep chickens contained in an area.